For many snake enthusiasts, California dreaming translates into dreaming about California snakes. In round numbers the state has about forty documented snake species and eighty snake subspecies. Many of them are endemic to California. For all California tourists, whether they visit the coastal areas, the desert, the valleys or the mountains, there’s always a new snake to picture. 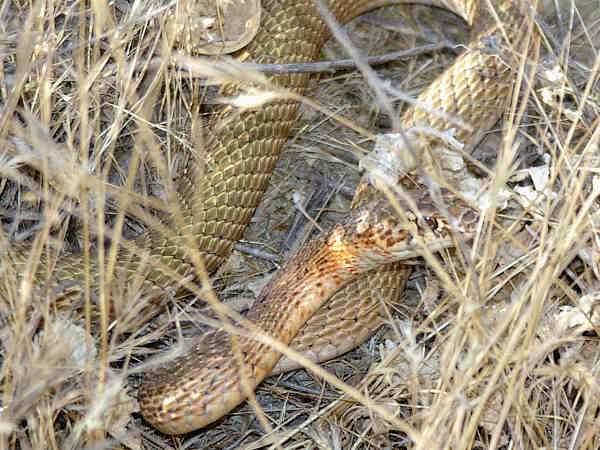 Here’s a top ten list of California snakes that tourists can easily add to their snake lists. 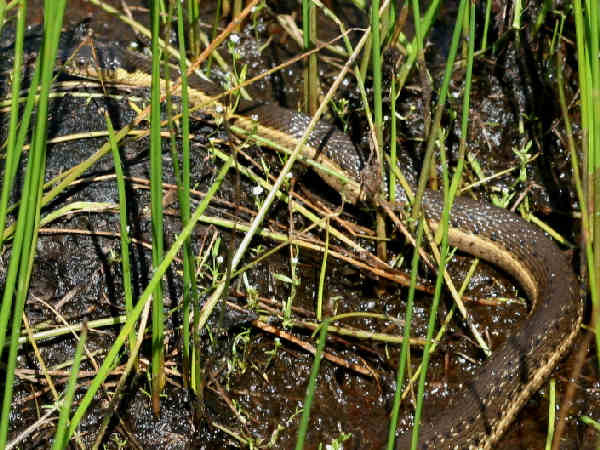 It consists of very common, nonlethal species such as kingsnakes, milksnakes, racers and gartersnakes. There are 7 different species of rattlesnakes found in California. Two of these species consist of more than one subspecies, making a total of 10 different types of rattlesnakes found in the state. These ten rattlesnakes are spread throughout the entire snake. Remember, you are not a kingsnake, so keep and eye and ear out for them. Speaking of kingsnakes, the top picture shows the king of all California snakes, the California Kingsnake (Lampropeltis californiae). It is very habitat adaptable and lives in most areas of the state except for the Northwest Redwoods and the higher elevations of the Sierra Mountains. In different habitats the look of the snake can change from a basic black body with thin white bands to a brown body with thicker white bands, to bodies with stripes down the body rather than bands. 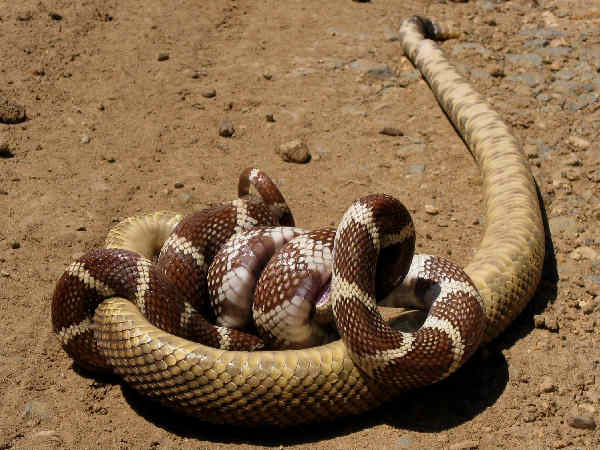 Like all kingsnakes, the California Kingsnake is immune to Rattlesnake venom, so when the two snakes cross paths, the Kingsnake typically wins. Sometimes the California Mountain Kingsnake (Lampropeltis zonata) gets listed with subspecies such as the Sierra Mountain Kingsnake (Lampropeltis zonata multicincta). 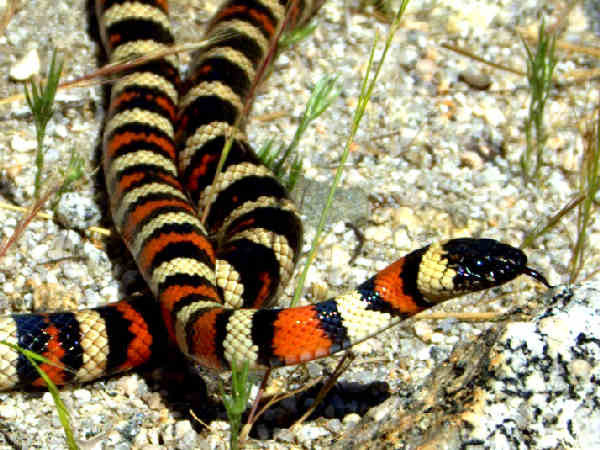 It’s the most colorful snake that visitors to Yosemite will see. Even better, it is a fairly calm and nonvenomous snake. 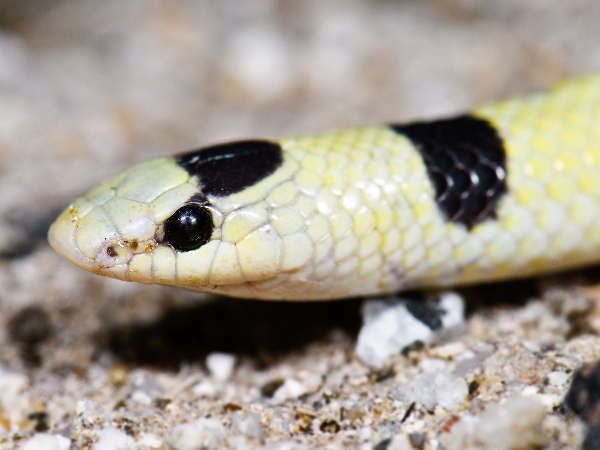 With the exception of the desert areas, California tourists have a good chance of meeting up with a Western Racer (Coluber constrictor mormon) also called the Yellow-bellied Racer. They are one subspecies of one of the most common of all native snakes. Coachwhips are equally as common as the racers in California. Typically the Southern California region hosts a Red Coachwhip, a common species across the southern border. Valley visitors driving down I5 might want to stop at any of the National Wildlife Refuges situated in the area from Sacramento to Kern. There they might find the San Joaquin Coachwhip (Coluber flagellum ruddocki). It’s another endemic California species. The California Striped Whipsnake (Coluber lateralis lateralis) also has a range that extends around most of California with the exception of the deserts and higher elevations of the Sierras. The picture shows the Alameda Whipsnake, another subspecies with a very limited range. Visitors to the desert area, might keep their eyes peeled on the road at night for a Mohave Shovel-nosed Snake (Chionactis occipitalis). It’s usually the least colorful of the desert shovel-nosed snakes. California is also a great garter snake destination. Four species and fourteen subspecies have been documented to date. Tourists in Southern California, especially those visiting the coastal areas from Los Angeles to San Diego can keep an eye open for the Two-striped Gartersnake (Thamnophis hammondii). The common name for the snake does not contain the word California in it. However, it’s an endemic species with a small coastal range. Interestingly enough, it lacks the stripe down the center of the body. Move up the coast a bit to the north and the Two-striped Gartersnake is replaced by the Santa Cruz Gartersnake. Its territory extends clear up the northern California Coast and spills into southern Oregon. Given its coastal range it is both aquatic and land based. The dull body color is offset by a bold stripe down the center of the back. It lacks the side stripes. 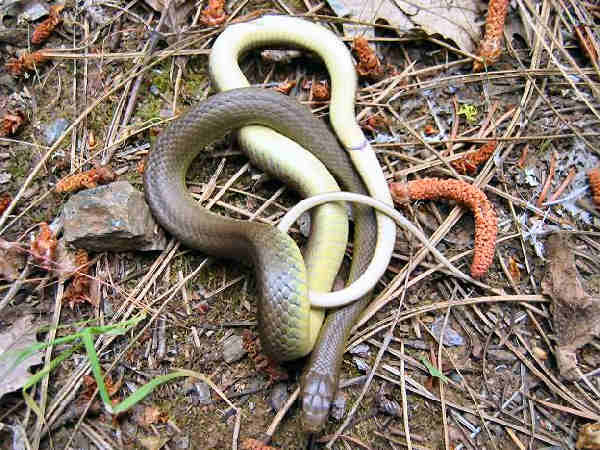 The Santa Cruz Gartersnake shares a territory with the Coastal Gartersnake. The red body coloration is the best way to differentiate between the two species. 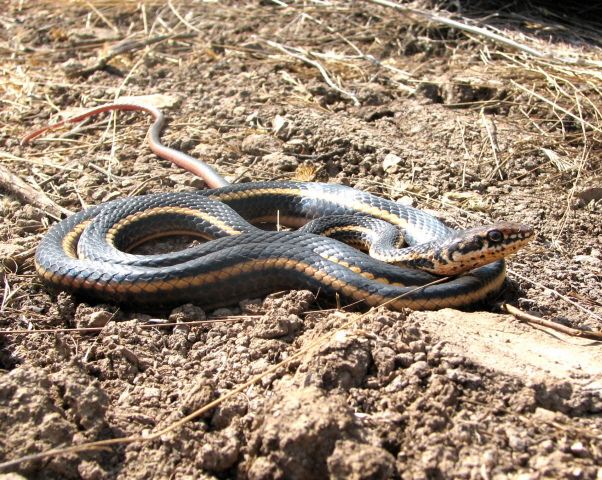 Coastal Gartersnakes are a subspecies of the very common Western Terrestrial Gartersnake (Thamnophis elegans). 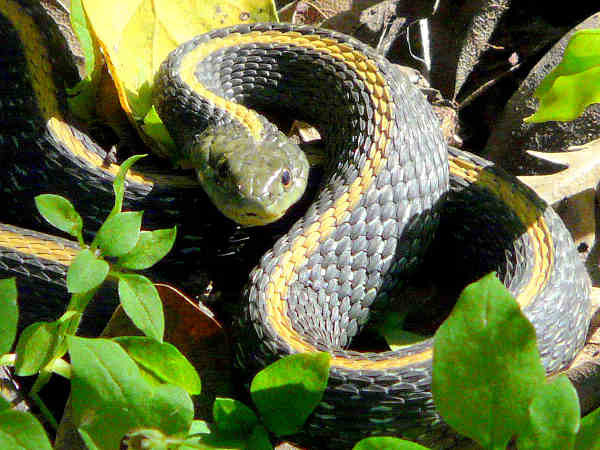 About a dozen subspecies of the Common Gartersnake (Thamnophis sirtalis) inhabit the United States. 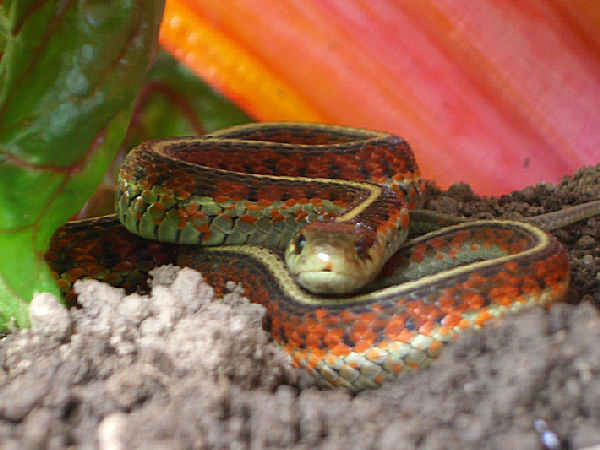 The San Francisco Gartersnake (Thamnophis sirtalis tetrataenia) inhabits only a small patch of land around the Bay area. 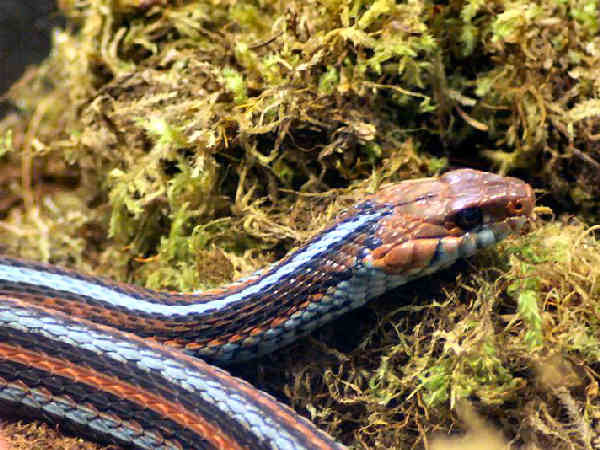 The colorful blue and red hued snake is even more colorful than the coastal gartersnake. It’s a must see for tourists.